This story continues to develop. Please expect that the information in the article below may be updated at any time, especially these first few days. I suggest that you to revisit and refresh. For example, it appears that No image profile found with name 'ESXi-6.5.0-20180104001-standard' has been pulled, see updates here for details. I'm a vSAN Systems Engineer (I started at VMware one year ago today! 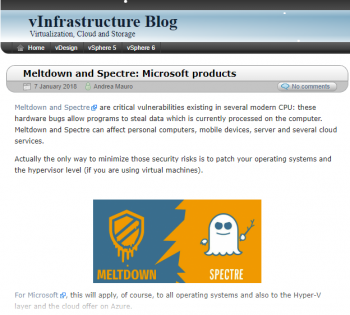 ), but this article isn't official VMware documentation. 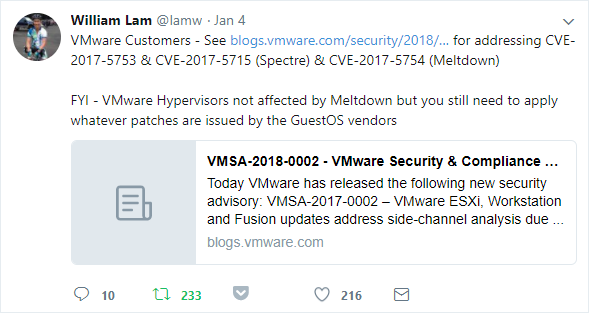 Please refer to vmware.com, and to each of the vendor's sites listed here, for their latest official information on this issue. It's your responsibility to back up first, and to proceed with updates at your own risk, as stated in the detailed disclaimer below every TinkerTry article. VMware vCenter Server 6.5 Update 1e Release Notes. ESXi release notes in KB52236 and KB52200. 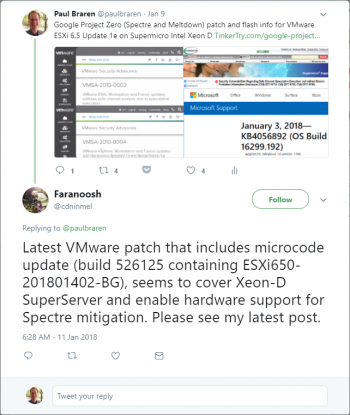 As for item 4 above, the integrated update mechanisms in most OSs have already handled this automatically, such as Microsoft Jan 3 2018 KB4056892 for Windows 10 version 1709 that hasn't been perfect, see also Microsoft yanks buggy Windows Meltdown/Spectre patches for AMD computers posted just yesterday at Computerworld. In a home lab environment, it's harder to see how this patching exercise is nearly as urgent as it would be for IT Professionals scrambling to patch their production environments. That said, it sure could be a good "rehearsal" for IT Pros who need to do this at work! 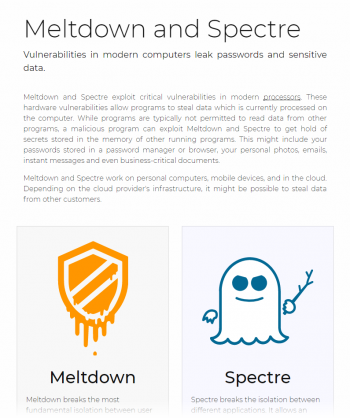 It seems the urgency is highest for cloud providers, where any known (albeit theoretical) data leakage possibility must be eliminated as quickly and carefully as possible. Unfortunately, unless you have an HA cluster where only VM reboots affect availability, you'll be having considerable down time here, as reboots of the server itself are required for the other 2 remediation steps. In early December we began distributing Intel firmware updates to our OEM partners. For Intel CPUs introduced in the past five years, we expect to issue updates for more than 90 percent of them within a week, and the remainder by the end of January. explored by me in much further detail here. Those are some pretty bold time frame estimates, but it is reassuring that the last time a BIOS patches by OEMs was needed urgently, the OEMs stepped up about as fast as promised, see also Many Intel CPUs contain Management Engine vulnerability to remote execution, here's sample outputs of the new INTEL-SA-00086 Detection Tool, which didn't affect Xeon D, but did affect my Dell Precision 5520 Core i7. 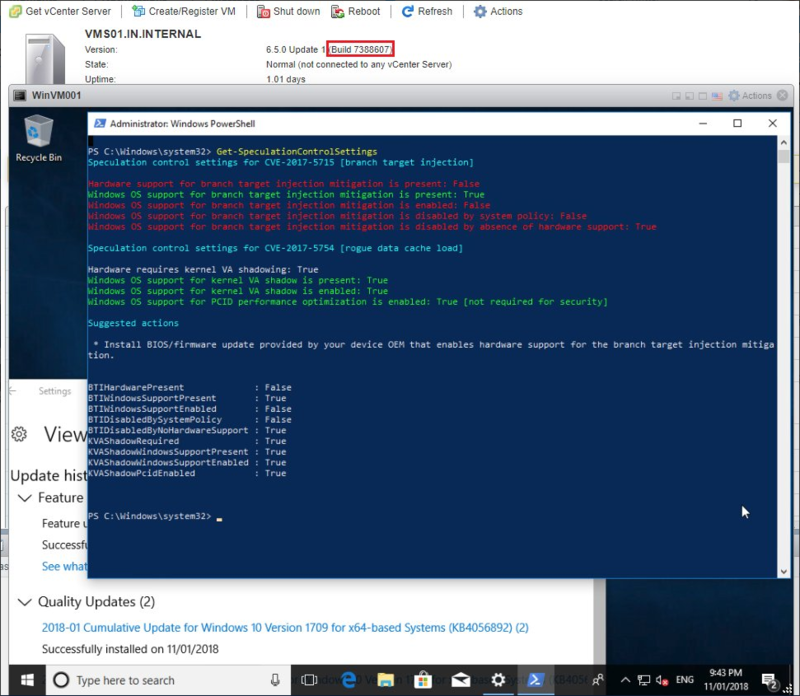 If you have VCSA 6.x, you should update that to 6.5U1e too, see VCSA release notes here, then follow along with the easy VCSA update method I documented step-by-step here. 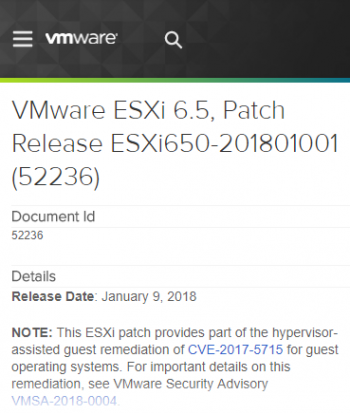 This installs ESXi650-201801402-BG, aka VMware ESXi 6.5, Patch Release ESXi650-201801001 (52236), and requires a reboot. Alternatively, you may prefer Michael White's alternative method detailed here. Fire up those dormant VMs, check to be sure automatic updates are turned on, then manually kick off an update check and reboot when prompted. 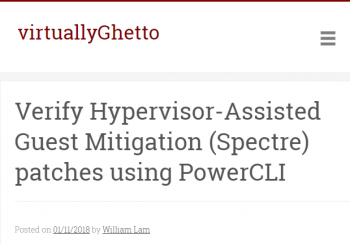 VMware has step-by-step details here, or use William Lam's more automated approach, see Verify Hypervisor-Assisted Guest Mitigation (Spectre) patches using PowerCLI. "Ensure that your VMs are using Virtual Hardware Version 9 or higher" (VMware KB 52085). You may wish to verify the steps actually worked, see SpeculationControlSettings details below. 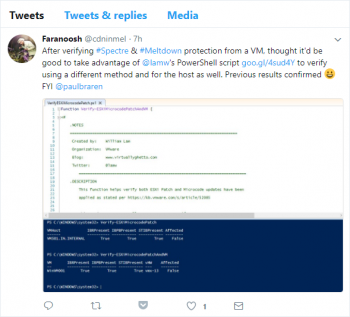 You may also wish to verify with @lamw's PowerShell script VerifyESXiMicrocodePatch.ps1 from Verify Hypervisor-Assisted Guest Mitigation (Spectre) patches using PowerCLI. 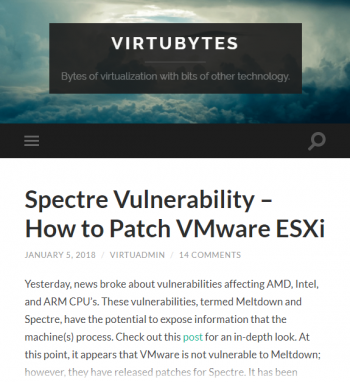 The article above was updated to make it clearer that VCSA should be upgraded first, and that it includes patches for Spectre/Meltdown. anywhere, which could make it a lot harder for folks to find this article when doing searches. This is now fixed. NOTE: This ESXi patch provides part of the hypervisor-assisted guest remediation of CVE-2017-5715 for guest operating systems. For important details on this remediation, see VMware Security Advisory VMSA-2018-0004. Now let's take a closer look at what's going on here. 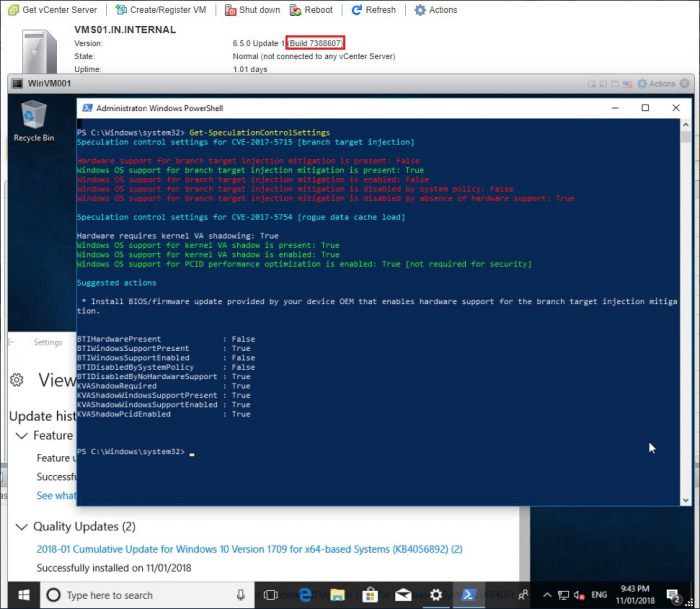 It appears that Get-SpeculationControlSettings seems works in a Windows VM! See screenshots below. I plan to test and confirm all this later on today, in my 2 Xeon D lab. I intentionally left one host patched to ESXi650-201801402-BG already (as shown in my video), and the other has not been patched. 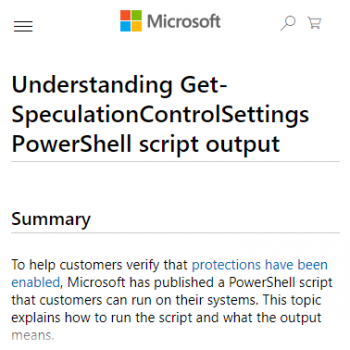 To help customers verify that protections have been enabled, Microsoft has published a PowerShell script that customers can run on their systems. This topic explains how to run the script and what the output means. Added William's new article to step 4 above. 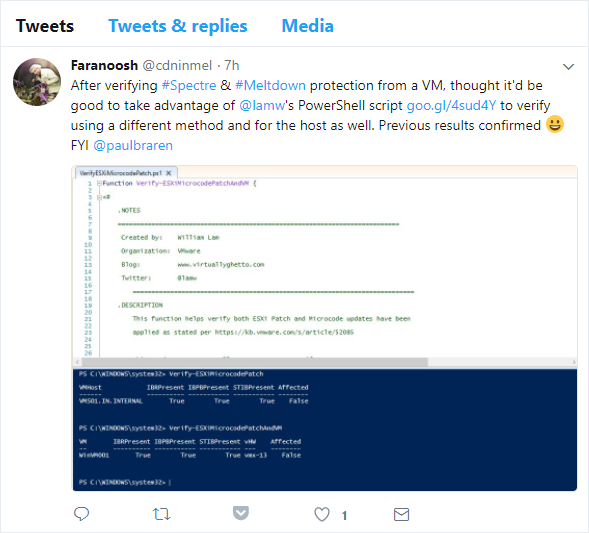 Faranoosh @cdninmel testing William Lam's script on Xeon D.
It currently appears this patch has been pulled off of the VMware update servers, see details at TinkerTry here. 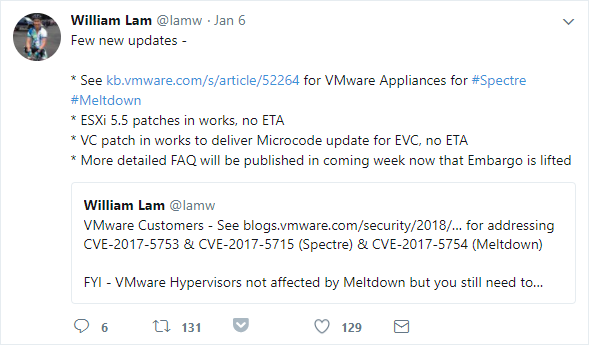 We will have to wait for more information from VMware, to see what happens next. 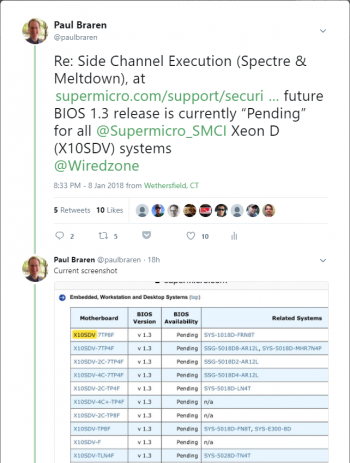 If you're not in production with your Xeon D and it's just a home lab, it would seem best to simply hold-off for a while, until things settle down, ideally waiting until the new BIOS 1.3 comes out too. At that point, I'm hoping to produce a video that shows me demonstrating the remediation steps, and the verification script in a VM, in the form of updates I'll be adding below this article! The script will ensure VMs are at least vHW9+ (as older vHW are not applicable) and that one of the three new CPU features are available as outlined by the KB. 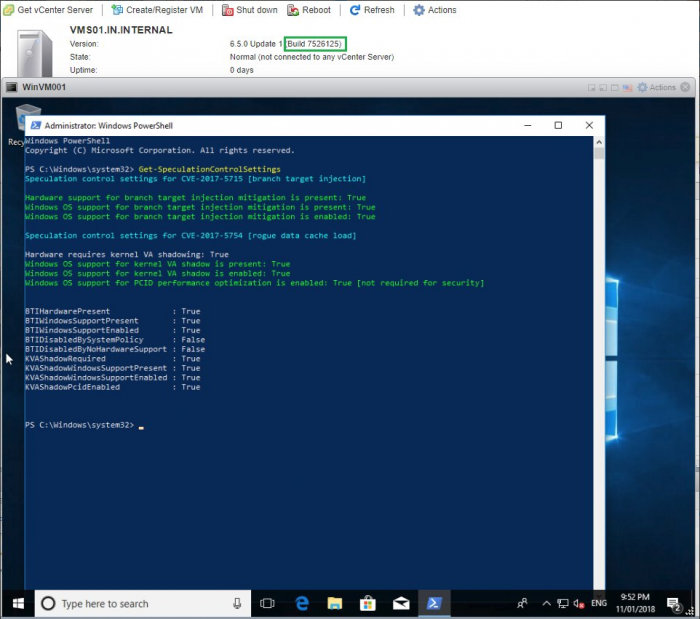 You attempted to install an image profile which would have resulted in the removal of VIBs ['INT_bootbank_intel-nvme_1.2.1.15-1OEM.650.0. 0.4598673']. If this is not what you intended, you may use the esxcli software profile update command to preserve the VIBs above. If this                                                    is what you intended, please use the --ok-to-remove option to explicitly allow the removal.